I can’t seem to resist geometric jewelry lately, so when I saw that Liz from Craftbaby had created her own version of the Voz Collective bracelets that I love so much, I decided to give it a try too. Since I didn’t want to be a total copycat, I chose some different patterns (but I’m still totally going to make myself a set with triangle designs too!). These were so quick and easy to put together that I think they’re the very definition of Craft Lightning! Be sure to stop by The Country Chic Cottage and 30 Minute Crafts to check out more Craft Lightning projects that come together in 15 minutes or less! 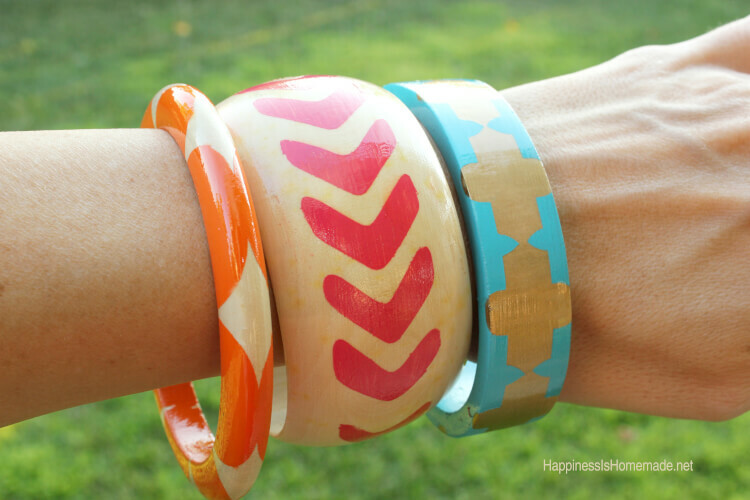 I started with unfinished wood bangle bracelets that I bought from DIY Bangles and gave them a quick coat of matte Mod Podge, a trick I learned awhile ago to help insure that the paint won’t bleed. I used my Silhouette Cameo to cut geometric patterns out of vinyl to use as stencils. 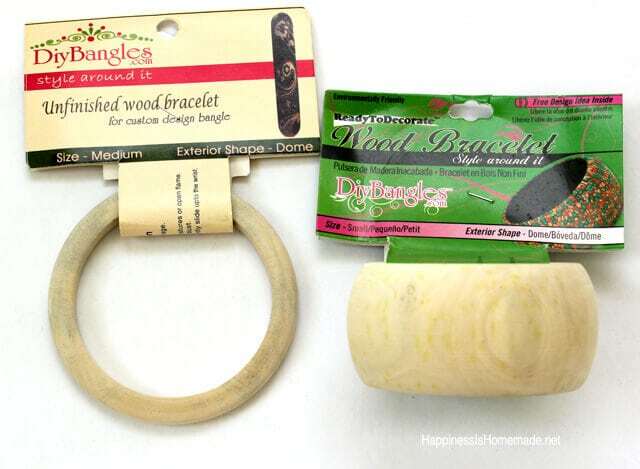 You could also use painter’s tape or contact paper to create your designs. Paint very carefully over the stencil using light pressure and a minimal amount of paint. Make sure to peel the stencil off while the paint is still slightly wet! 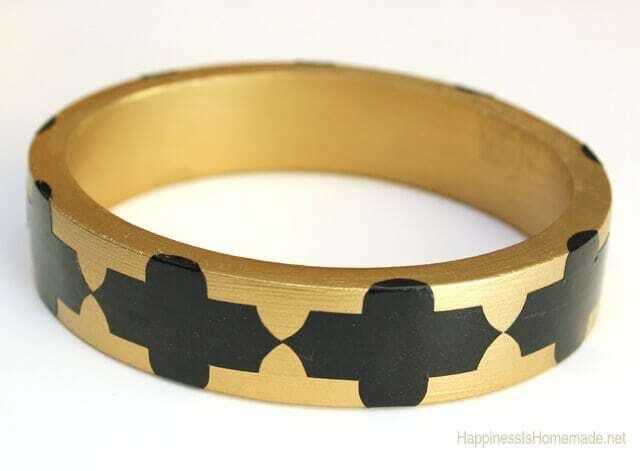 For this bracelet, I started by spray painting it with a base coat of gold, and then topped it with my black vinyl shapes to create a mask. (Isn’t it cute like this? 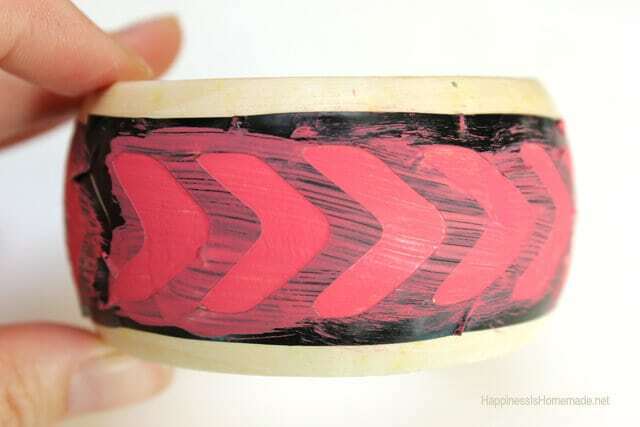 I almost considered leaving it like this until I remembered I was supposed to be writing a blog post about stenciled wood bangle bracelets). 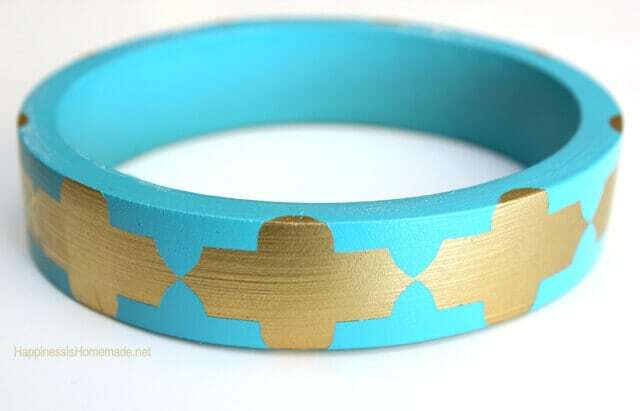 I painted the entire bracelet with a top coat of aqua spray paint, peeled off the vinyl stickers and voila! So cute! A final coat of Mod Podge Super Gloss spray sealer makes everything shiny and helps boost durability. 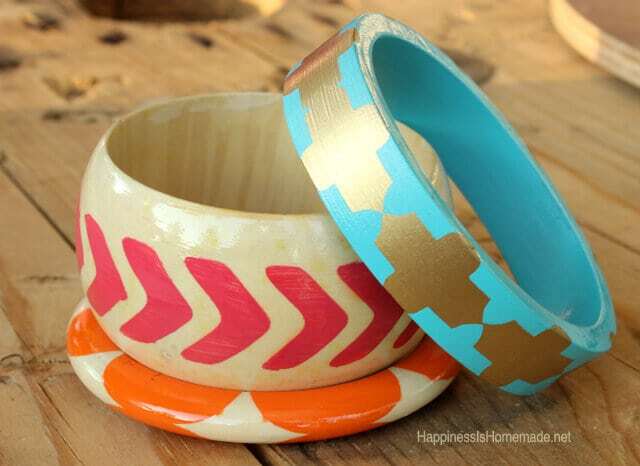 There they are – an entire set of trendy stenciled wood bangle bracelets in just under 15 minutes (not including drying time) – for a fraction of the cost! « Project Life is Back on HSN! I vote that we all fly out to New York and have a bracelet making party. I hear that someone out there has an empty apartment that’s just waiting for guests 😉 Haha, seriously though, the Super Shine spray is ah-mazing! I use it on everything! P.S. So when do we get YOUR new house tour? I’m dying to see it all! So far it looks incredible! Yessss!!! When? We are IN!! Girls trip! Hey, just found you on the Sac bloggers website. I am also a Sac craft blogger. Love this project and love your blog! Thanks, Jessica! I just hopped over and checked yours out too! Wanted to let you know that this tutorial was featured on the At Play Blog today. Holy Love! These are awesome!